A naturally gifted scientist and tinkerer, Natalya helped Oksana explore the abandoned technologies of Kizhi and worked to improve them. Now she serves Oksana and her New Guard as 2nd Lieutenant, marching into battle in her Kostjak Bronka Apparat (KBA) suit. With the KBA suit, she gains protection from harm and always has a weapon at the ready for hand-to-hand combat. Her suit also helps her carry her devastating Volta Lightning Cannon, which can target multiple combatants with a single blast. 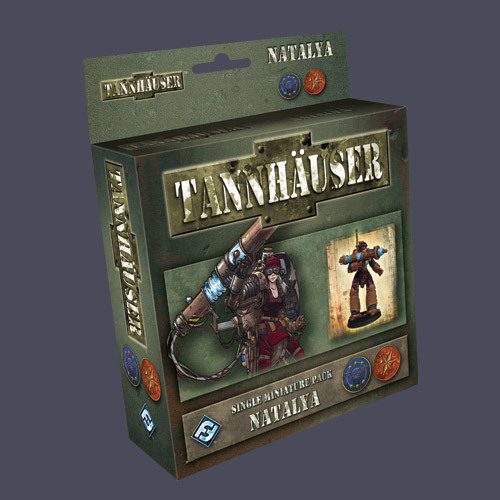 Natalya is an Epic Hero and comes complete with a sculpted and painted miniature, character sheet, tokens, equipment cards, and a rulebook, which contains rules for including her in your team, as well as a unique scenario to test her leadership skills and the resilience of her KBA suit.